As of this writing, it appears that the next FAST AND THE FURIOUS sequel will be partially filmed in...Cleveland, in the next month or so. Those of you reading this in some far-future internet archive, say 80 years from now, may have to be reminded that 2016 was also the year that right around the same time, the Republican National Convention was held in Cleveland. Coincidence? I wonder if the car-chase action series isn't just hoping that political protestors will burn the whole city to the ground coincident with their shooting stunt sequences in the foreground. Thus, epic special f/x, absolutely free of charge! Only excuse I make for taking the franchise to Cleveland. It's a bad economy here in 2016, after all. You internet kids reading this archived in 2096 - most likely you are a race of superintelligent apes who overthrew mankind; I know how that goes - can probably just take your copy of the seventh or eighth FAST AND THE FURIOUS sequel off your antiques shelf and check out if I am correct or not. 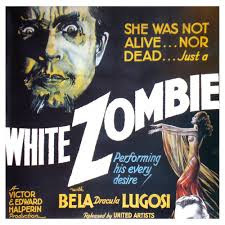 Talk of the antiques shelf and movies from 80 years ago that are enigmas to the descendants of their first-night viewers brings us to WHITE ZOMBIE. Aye, long before it was the name of a heavy-metal band the title WHITE ZOMBIE was applied to a 1932 short feature that turned into something of a minor-league horror legend. The flick is extremely stiff and musty by modern standards. But it still creeps you out in parts, partially due to that stiff/musty quality. It is for horror addicts with a yen for the vintage, weird stuff to discuss whether director Victor Halperin was a genre genius, or if just the primitive aesthetics of early talkies and the subject matter, dictated a mouldy-graveyard quality to the material all on its own. Setting is the island of Haiti - which, for 1930s audiences, remember, would be far-off place of exotic danger and mystery, visited vicariously through old copies of National Geographic, more so than the strife-torn trouble spot sharing real estate with the Dominican Republic that we all see on the nightly news. Bela Lugosi (who some say secretly co-directed) plays Legendre, a quasi-French Haitian plantation owner with really weird facial hair and Voodoo-doll mojo, who uses reanimated dead men - principally his old enemies - as slaves in his sugar plantation and factory (one tired zombie falls into the big grinder; nobody notices). A young engaged couple are en route nearby to the mansion of the wealthy Beaumont (Robert Frazer) to be married. But Beaumont gets a bad case of lust for the bride, Madeline (much as the character is virginal and an undead-ringer for "Miss Crabtree" in the Little Rascals shorts, actress Madge Bellamy has a brief underwear-clad scene that flirts with pre-Hayes Code sensuality). Beaumont hires Legendre to put a Voodoo spell over Madeline to make her appear to die, hypnotically transforming her into a willing zombie love slave. But what if Legendre has some indecent notions of his own? As the title signifies, most of the zombies shown here actually are white - probably, in the end, a mercy, as the pic sidesteps the sorry racial stereotypes of old Hollywood (Clarence Muse, an iconic black actor of the 1930s, does have a brief scene as a coachman in the opener). It's worth noting that Lugosi had just done his career-breakthrough role as Dracula right before this came out, and a lot of the vibe is strongly reminiscent. Bela has several great scenes in which the camera just goes for close-ups of Legendre's glaring orbs. Some fans call WHITE ZOMBIE just as good as DRACULA, and they praise the picture's eerie, dreamlike ambiance, creative framing and creepy, cavernous sets. Still, the slow pace and creaky script does make it more of a curio for jaded modern audiences.